Rep. Gabrielle Giffords (D-Arizona), was shot through the head on Saturday, January 8, in Tucson Arizona and remains in critical condition. Back on March 22, 2010, just hours after Giffords voted to pass the health reform bill, the glass door of her office in Tucson was smashed. The following evening, Sarah Palin revealed her list of 20 Democratic members of Congress she urged her followers to defeat. Unfortunately, there were consequences—in spite of media’s attempts to gloss it over. Here is the MSNBC interview. Giffords’ comments about Palin’s threats appear at the 2:20 mark. And here is a police recording of the Palin’s drunken brawl in Alaska on September 6, 2014. Sarah Palin’s target got hit!!! It’s crazy for Palin to put up all those gunsites! Incitement to kill from Palin. Yes, Dan – very dangerous and foolish words from Sarah Palin. Hopefully, this ends her presidential aspirations. Palin whips people up into a frenzy whenever she possibly can. She needs to take responsibility for her acts of incitement and if she is incapable of knowing right from wrong where that is concerned, then she needs to be locked up and given psychiatric help to understand the extent to which she resorts to the same tactics Hitler used on his road to power. 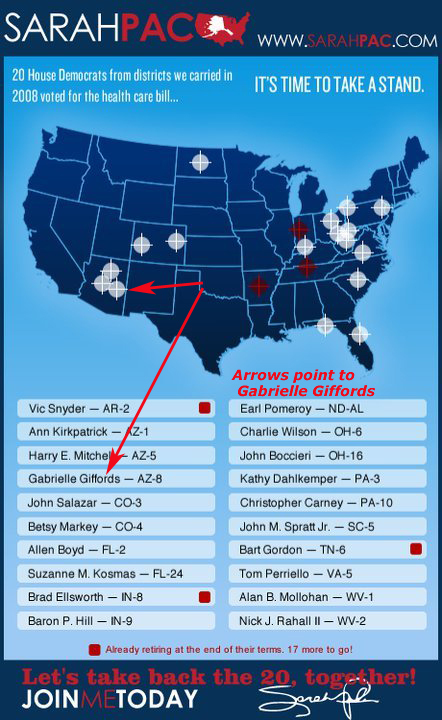 Congresswoman Gabby was on Sarah Palin’s target list. Gabby got shot in the head, and Sarah Palin takes down her gunsite target list. Go figure!